1. A town in Benjamin (Josh. xviii. 23) situated, according to Eusebius, five miles northeast of Beth-el, and probably identical with the modern Al-Ṭaiyyibah. According to I Sam. xiii. 17, it must have been a few miles north of Michmash; for one of the three expeditions of the Philistines against Saul, who was in Gibeah of Benjamin, went thither. 2. Family seat of the Abiezrites, where an angel appeared to Gideon, and where he built an altar for a thank-offering (Judges vi. 11, 24). There, too, he brought the earrings of the conquered Midianites, and made an ephod of them, "which thing became a snare unto Gideon, and to his house" (ib. viii. 27); and there he died and was buried (ib. verse 32).Ophrah was taken from Jeroboam by Abijah (II Chron. xiii. 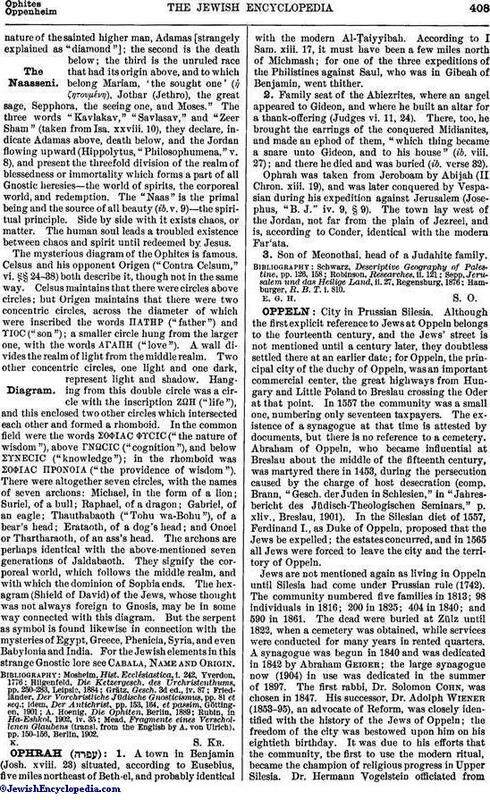 19), and was later conquered by Vespasian during his expedition against Jerusalem (Josephus, "B. J." iv. 9, § 9). The town lay west of the Jordan, not far from the plain of Jezreel, and is, according to Conder, identical with the modern Far'ata. 3. Son of Meonothai, head of a Judahite family. Hamburger, R. B. T. i. 810.